This experiment was with 'Litho-coal'. Lithocoal is a heat fixable charcoal. 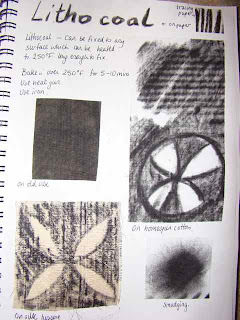 You can draw with it and then heat it in an oven to set it or on fabric just heat with an iron. I had never heard of it till Jenny Bowker sent me some of it to try last year. The top photo shows Lithocoal on various different fabrics such as silk tussore and cotton. I also tried smudging it. 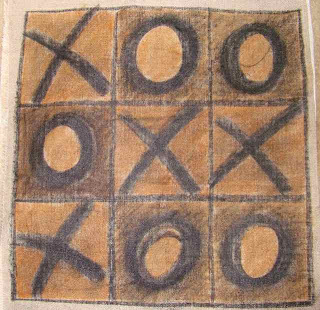 The bottom photo shows Lithocoal used to draw the black noughts and crosses and Derwent Colour Inktense pencils used for the brown areas. The underlying fabric is a pale brown linen. For the Lithocoal (I have been unable to find a supplier in New Zealand) draw onto the fabric, cover with baking paper and then iron on hot setting for 1-2 minutes. For the Derwent Inktense pencils. Colour in, then use water to spread the pencil colour as a wash (like you would with Aquarelles when doing a pen and wash drawing) For more intense colours use fabric medium to spread as a wash. I have tested whether the pencil colour washes out in water but it is pretty good. There is some loss of colour if you don't use fabric medium. Have you thought of using a soldering iron for texture? I know it cuts holes but maybe this could give depth?